This section provides information about WMDA publications. Since 1992 WMDA has published several publications in order to promote international collaboration, information exchange and best practices in stem cell provision. You can see a complete list of the WMDA publications published in scientific journals. WMDA is an active network of professionals. The WMDA members are providing recommendations and guidelines in different areas of Stem Cell Donor Provision. You can find the current recommendations on WMDA Share. WMDA members receive the three-weekly e-newsletter: Stem Cell Matters. This newsletter provides all information about the future directions of the WMDA, the work of the committees and the news from the community. Also specific topics or initiatives related to international exchange of cells and stem cell transplantation can be found in Stem Cell Matters. Sign up today as WMDA member, and receive Stem Cell Matters automatically. 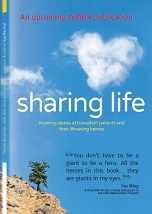 WMDA has published a book about heroes donors who have donated their bone marrow or blood stem cells to save a stranger’s life. Behind the scenes, there are amazing people who play an unseen but vital role in the journey these cells make from the donor to a patient. These include medical personnel, search coordinators, donor recruiters and couriers. Nearly 50% of the patients have received cells from a donor who lives in another country. This means that each day over 20 couriers travel across continents to reach the patients and their families, whose lives will soon be changed forever. This is a collection of true stories about people who care, who have reached across boundaries of nationality, ethnicity and geography to make a real difference to the lives of patients in need. Read more how to order this unique book. WMDA brings out annually a report to inform about the activities done by the committees and working groups in the previous year. It is an Association Bulletin and provides a good overview of all WMDA activities. The report can be downloaded here.